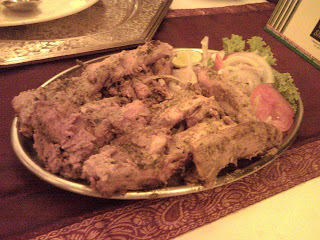 Sahib Sindh Sultan is a part of the BJN Group and I must admit to being a fan of their restaurants. The themes, decor, the food are almost always great and spot on. 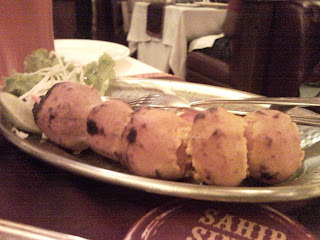 This afternoon, we headed to Sahib Sindh Sultan in Forum Mall, Koramangala. 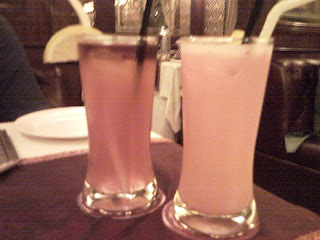 Its a fabulously done restaurant that is done up like the royal trains of the Raj era. One half of the restaurant is a the platform, complete with painted murals of book stalls, canteens and the station master's chamber. And the other half is an elevated bogie of a train that makes the comfort of the Rajdhani Express seem trifle. 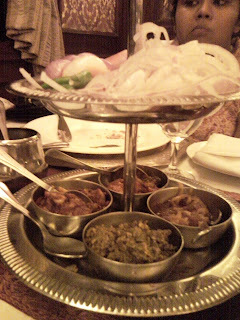 The menu is a good selection of choice Indian foods from several regions, largely the North West. This is not our first visit to Sahib Sindh Sultan and our favorite has always been the Zamindari Achari Aloo. This is an aloo tikka that has been smothered with pickling spices and yoghurt, rolled in a light coat of besan and put into a tandoor. The result is a great melange of tangy tastes made even better with a dollop of mint chutney on the side. 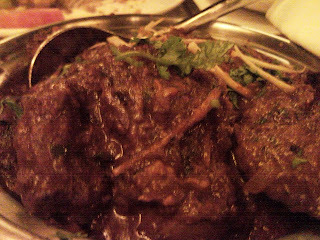 This is perhaps the only Indian restaurant where you really do taste the pickling spices in the dish. yoghurt based one. Fun way to wait for food. The Leberiyan - a slender cut of lamb steeped in yoghurt and spices and char-grilled caught our attention in terms of non-vegetarian starters. I must say that the marination must have been a really long process spanning a few days. The texture of meat was something I have not tasted before. It is rubbery to the knife, but absolutely melt-in-the-mouth once you bite into it. Though yummy, this is one starter that you should hold back on if you want to enjoy your meal. Once done with it, you are not really left with much space. All drinks on the bar menu have a railway inspiration. Sudhakar had a cocktail called Fast Track which was three types of rums mixed with a bit of orange juice and possibly a few other ingredients that I don't remember. It was potent from the word go! I had a mocktails, again the name I don't remember, but it had a base of strawberry and orange juice. A simple description of this would be a dessert I could drink. Nice!!! For the main course we opted for the Rajasthani Lal Maans which I have been dying to try out since I saw the recipe on TV. 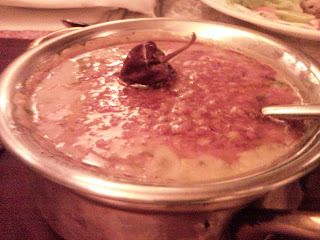 It turned out to be true to its name it was red and fire-extinguisher-in-mouth spicy (which is good for me!!). A great accompaniment to the rotis we ordered as well as the steamed rice (basmathi) and the dal (not Maa ka Dal on the menu). All good dishes which made a satisfying meal. Now came the fun part, dessert. 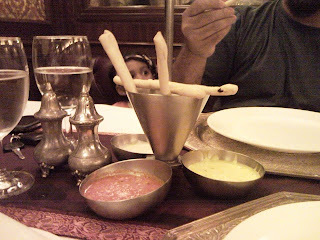 We have loved their flambe gulab jamun from the first time we had it. A single huge gulab jamun drowned in sugar syrup and bursting with dried fruits is brought to the table. Next a small shot glass of brandy is heated with the help of a lighter. It bursts into a blue flame when it hits the right temperature. This is poured onto the jamun. Once the flame settles down, each bite of the gulab jamun sends you to Indian sweet heaven. PS: You may end up a bit tipsy if you have had a 3-rum cocktail before that. But the buzz is great. The service is nice, as is customary with BJN restaurants. This time round, I found that every bearer seemed knowledgeable about the menu and the dishes. The loos unfortunately are not exclusive to the restaurant and you have to go all the way out to the Forum Mall loos outside the restaurant set-up. Can be a kill-joy when you have a kid who remembers they have to go at the last second. 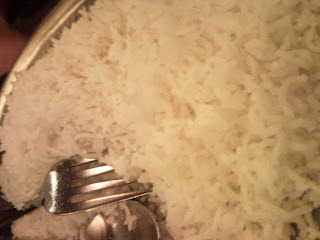 The bill of course is a little steep and we shelled out approximately Rs 2300 for the entire meal. A good splurge on occasion. Parking: No exclusive parking. But the mall has sufficient space.